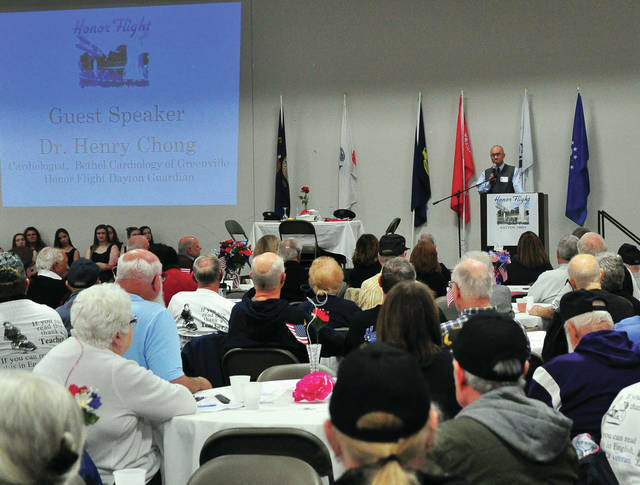 Mike Ullery | Daily Call Dr. Henry Chong, MD, a physician out of Greenville delivers the keynote address during Sunday’s 13th annual Honor Flight Dayton reunion at the Clark Co. Fairgrounds. Mike Ullery | Daily Call file photo Troy resident Tom Elliott, center, prepares to board a charter aircraft taking more than 100 veterans on a September Honor Flight Dayton trip to Washington, D.C. Elliott is a veteran of the U.S. Air Force who served in Vietnam. SPRINGFIELD — More than 900 veterans and guests filled the Events Center at the Clark County Fairgrounds on Sunday to attend Honor Flight Dayton’s 13th annual “family” reunion. To Honor Flight Dayton volunteers, each and every veteran is family. Veterans, some that go back to the first Honor Flight trip in 2005 when 12 World War II veterans flew to Washington in six small aircraft, meet once a year to rekindle friendships, and most important, to remember fellow veterans no longer with us. Honor Flight Dayton has grown. Each trip now takes more than 100 veterans aboard a charter aircraft to visit our nation’s capitol, but although the numbers have changed, the mission has not. Honor Flight Dayton is about getting veterans of World War II, the Korean War, and the Vietnam War, to Washington, D.C. to visit their monuments. At Sunday’s reunion, veterans and guests met guest speaker, Dr. Henry Chong, MD. Chong is a cardiologist who works at Bethel Cardiology of Greenville and has served as an Honor Flight Dayton Guardian. Dr. Chong’s message to veterans was to answer the question, “Did you make a difference?” Chong is the grandson of a North Korean women whom he never met. Early in the Korean War, his grandmother made the courageous decision to send her then-oldest son into South Korea, where American troops were fighting and helping to protect Koreans in the South. Kelley Cox, vice president of Honor Flight Dayton, offered the “box score” for the 2018 Honor Flight Dayton season. 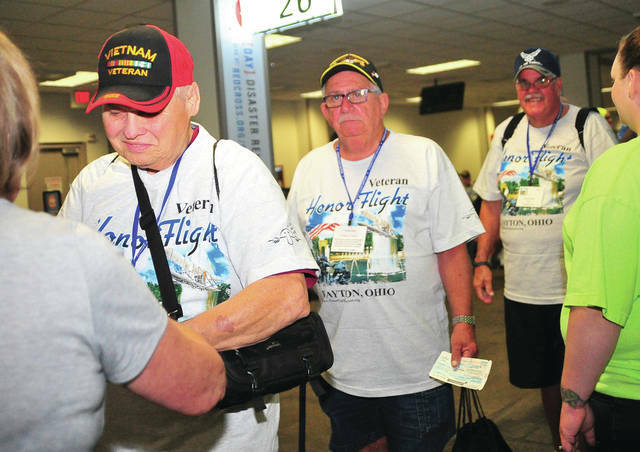 A total of 433 veterans were flown, all from Dayton International Airport. These included 26 veterans of World War II, 60 Korean War vets, and 347 veterans of the Vietnam War. Two of the veterans had seen service in all three wars. There were nine women veterans, eight sets of brothers, one married couple, and one father/son. Veterans included 202 Army vets, 93 Navy, 32 Marines, 98 USAF/USAAC, one Coast Guard, and seven vets who served in multiple branches. The oldest veteran to make the trip this year was 100 years old while the youngest was 62. Applications can also be found for those who wish to be a Guardian on the trip or become a volunteer. https://www.vandaliadrummernews.com/wp-content/uploads/sites/19/2018/11/web1_111818mju_honorflight1.jpgMike Ullery | Daily Call Dr. Henry Chong, MD, a physician out of Greenville delivers the keynote address during Sunday’s 13th annual Honor Flight Dayton reunion at the Clark Co. Fairgrounds. https://www.vandaliadrummernews.com/wp-content/uploads/sites/19/2018/11/web1_0918mju_honorflight2.jpgMike Ullery | Daily Call file photo Troy resident Tom Elliott, center, prepares to board a charter aircraft taking more than 100 veterans on a September Honor Flight Dayton trip to Washington, D.C. Elliott is a veteran of the U.S. Air Force who served in Vietnam.